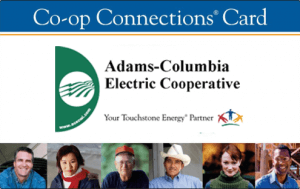 As a member of Adams-Columbia Electric Cooperative, you are receiving a FREE Co-op Connections card that allows you to save money at local businesses and so much more! There is no cost and no expiration. It’s simply a benefit of your cooperative membership. Show your Co-op Connections card (physical card or digital card on the app) at any participating local business and receive their discount. If you’d like a physical card, contact our office and we’d be happy to mail one to you. What local businesses can I savE at? Please note – this listing may change at any time. 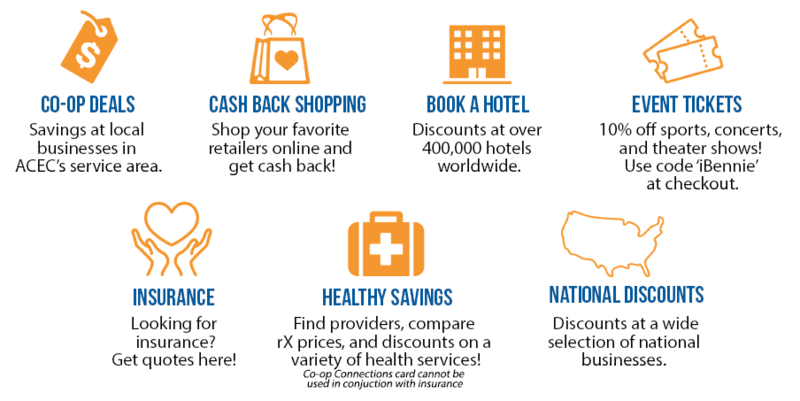 Visit www.connections.coop for exclusions and more information. Okay, I’m sold! How can I start? Start by downloading the Co-op Connections mobile app from Google Play or the App Store, or visit www.connections.coop. Create an account and that’s it! Explore the app and website, and enjoy the savings.